AI Media is an Australian social enterprise, who’s mission is to establish a method by which teachers in a classroom can lecture students, and the lecture will automatically appear as text on the student’s Laptop. The system works in all formats, including iOs, OSX and Android. words into a server, which captions and streams it back out to the student’s computer or other Internet aware device. They claim that this can replace three people in the classroom. An Auslan (Australian Sign Language) interpreter, a speaker and a note taker. I’m not sure what all these people would do. It seems to me that a terp could handle the entire job, but nonetheless their point is a valid one. It’s not that we want to put interpreters out of work – replace them with machines, but rather that there are insufficient trained and qualified interpreters available. This system can cover that disparity. It can also help cash strapped schools offer inclusion where they couldn’t otherwise afford the huge costs associated with providing interpreters for every classroom. This video, from their site, explains more fully. Posted in News.Tagged #JusticeForFelix, AI Media, Android, Auslan, BitcoDavid, Deaf in Prison, Deaf Students, DeafInPrison.com, Live Captioning, Streaming media. I would like this technology in our postsecondary programs at the university level for the deaf students. I am wondering if it could be used for online courses with videos of teachers lecturing? I’m going to find out. Jim Ridgeway has also contacted me about a potential use for it. I will be trying to establish a contact with them over the next few days, and I will update everybody as to the outcome of that effort. 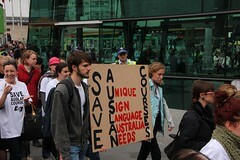 There is the problem that they are located in Australia, which may be an issue regarding ASL vs. Auslan. There has certainly been a lot of interest here in the States though. Previous Post DeafInPrison.com Celebrates its 200th Post!